Synthetic peptide within Human HPRT aa 200-300. The exact sequence is proprietary. Our Abpromise guarantee covers the use of ab109021 in the following tested applications. WB 1/10000 - 1/50000. Predicted molecular weight: 25 kDa. Heat up to 98 °C, below boiling, and then let cool for 10-20 min. See IHC antigen retrieval protocols. Purine metabolism; IMP biosynthesis via salvage pathway; IMP from hypoxanthine: step 1/1. Defects in HPRT1 are the cause of Lesch-Nyhan syndrome (LNS) [MIM:300322]. LNS is characterized by complete lack of enzymatic activity that results in hyperuricemia, choreoathetosis, mental retardation, and compulsive self-mutilation. Defects in HPRT1 are the cause of gout HPRT-related (GOUT-HPRT) [MIM:300323]; also known as HPRT-related gout or Kelley-Seegmiller syndrome. Gout is characterized by partial enzyme activity and hyperuricemia. Belongs to the purine/pyrimidine phosphoribosyltransferase family. ab109021 (purified) at 1:30 dilution (2µg) immunoprecipitating HPRT in Rat brain lysate. Lanes 1 - 4: Merged signal (red and green). Green - ab109021 observed at 25 kDa. Red - loading control, ab8245, observed at 37 kDa. 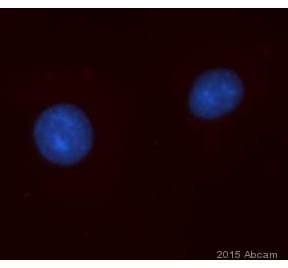 Unpurified ab109021 was shown to specifically react with HPRT1 in wild-type HAP1 cells. No band was observed when HPRT1 knockout samples were examined. Wild-type and HPRT1 knockout samples were subjected to SDS-PAGE. ab109021 and ab8245 (Mouse anti GAPDH loading control) were both diluted at 1/10,000 and incubated overnight at 4°C. Blots were developed with Goat anti-Rabbit IgG H&L (IRDye® 800CW) preabsorbed ab216773 and Goat anti-Mouse IgG H&L (IRDye® 680RD) preabsorbed ab216776 secondary antibodies at 1/10,000 dilution for 1 hour at room temperature before imaging. Unpurified ab109021 at 1/50 dilution staining HPRT in Human colon by Immunohistochemistry, Paraffin-embedded tissue. Publishing research using ab109021? Please let us know so that we can cite the reference in this datasheet.